Minneapolis Establishment On the Ropes: Time to Build a Political Alternative! In 2013, Minneapolis Mayor Betsy Hodges was elected along with a whole slate of city council members with a bold mandate to address Minneapolis’ worst in the country racial and economic inequalities. What progress has been achieved like becoming the first midwest city to pass a $15 minimum wage has been the result of relentless organizing from below. With election day three months away and massive frustration at politics as usual in City Hall, the growing momentum behind Ginger Jentzen’s independent socialist campaign shows we can build an alternative. The most recent crisis started with another senseless murder at the hands of a totally out of control and unaccountable Minneapolis Police Department (MPD). A year and a half after the killing of Jamar Clark and the eviction of the 4th-Precinct occupation, and with the acquittal of Philando Castile’s killer fresh on everyone’s mind, Justine Damond from Australia lay dead in South Minneapolis after calling 911. The body cameras were turned off. Chief Janeé Harteau initially tried to explain away the incident as the rogue actions of an individual officer, only to abruptly resign hours later. Now there are growing calls for Mayor Hodges to resign as well. There is a risk that campaign politics could eclipse the need for real reform. Hodges’ decision to sacrifice Chief Harteau now and not earlier—despite well-documented tensions between City Hall and the MPD—seems motivated by the desire to avoid international media scrutiny in an election year. One of the loudest critics of Mayor Hodges is Council Member Jacob Frey, a mayoral candidate as well. There is little reason to believe he offers a real alternative. Just a few weeks ago, Frey was exposed for accepting campaign donations from the police union headed by Bob Kroll, an infamous figure who compared Black Lives Matter to a terrorist organization. The City Council and Mayor Hodges should step back and hand over the process to a democratically elected civilian committee with real powers to conduct an independent, transparent investigation into the MPD, starting with selecting new department leadership. Real resources should also be put into building mass community meetings across the city where people can play an active role in a top to bottom restructuring of policing in Minneapolis, including addressing the militarization of the police, how officers are trained, hiring and firing policy, department priorities, and budgets. 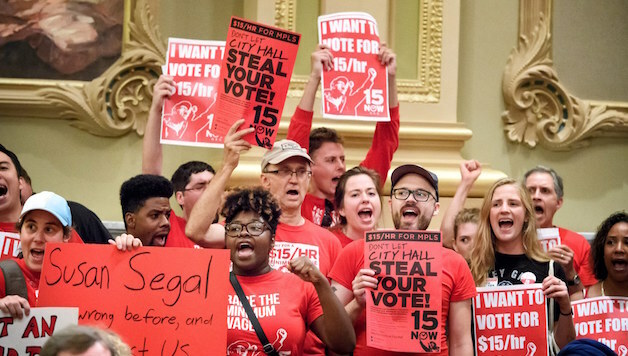 At the end of July, Minneapolis became the first Midwestern city to enact a $15 an hour minimum wage. The proposal will benefit 71,000 workers, overwhelmingly women and workers of color. Winning $15 in Minneapolis shows another way cities can push back against Trump’s corporate-backed agenda. Mayor Hodges and most in City Council, however, resisted $15 up until a constant movement from below forced them to act. Where sitting councillors stood on the $15 minimum wage, alongside other demands for racial equity reforms, has emerged as a central dividing line in the hotly contested 2017 city council races. big-business-backed Democrats in City Hall faced growing pressure from insurgent Berniecrat challengers, fueling record turnout in the Democratic Party caucuses this spring. Ray Dehn, a relative outsider to local politics, won the most votes at the Democratic Party (DFL) convention for the mayoral election. Like Ginger Jentzen, Dehn is endorsed by the Minnesota Nurses Association, Communications Workers of America, and Our Revolution Twin Cities. Current Mayor Betsy Hodges came in last place among viable candidates, while current Ward 3 City Council Member Jacob Frey came in second, though he has raised the most money by far. Nekima Levy-Pounds, a leader of the local Minneapolis NAACP chapter and prominent in the BLM movement, is also running for mayor. She did not seek the DFL endorsement, but she is not explicitly running as an independent. Unlike the other mayoral candidates, Nekima has used her campaign to organize rallies and protests. Ginger Jentzen’s independent socialist Ward 3 City Council campaign stands out. Using her campaign to escalate the pressure for $15 inside City Hall, the Socialist Alternative member and former Executive Director of 15 Now is offering voters a taste of what a socialist organizer elected to City Hall could accomplish. Much like Kshama Sawant’s successful socialist campaigns for Seattle City Council, Jentzen’s campaign is having a city-wide impact by acting as a platform to amplify working class struggles. We have the potential to build something new. Bernie’s call for a political revolution against the billionaire class produced a deep echo in Minneapolis, though few in City Hall supported him. The fact that so many left-insurgent candidates are running viable campaigns against incumbents is a step forward. However, we urge more candidates to join Ginger Jentzen and Kshama Sawant in refusing to take a penny from the corporate executives and big business lobbyists who typically dominate Democratic Party politics. We urge others to make a clean break with the DFL, and base their program on unapologetic demands that speak to the real needs of working-class people. In Minneapolis, this includes taxing the rich to fund affordable housing, rent control, and ending all policies that resemble “stop and frisk” in the MPD by creating an elected review board with full powers over the Minneapolis Police Department including budgets and department priorities.